I had grand plans to neglect the laundry and do an outdoor fall photo shoot with Bubbers today. (I just loved Tearese’s). But given the sudden torrential rainfall, I decided against it. (Speaking of which, it’s amazing how threats of a severe windstorm can motivate me to organize my food storage. Very quickly. And with great gusto). (This is when Charming prays that I decided to do the laundry). I set up Heidi’s Portrait Studio and took some more 6 mos. pictures of Bubbers. Yay!! After I get all my sessions done, I’ll post some of his pictures. 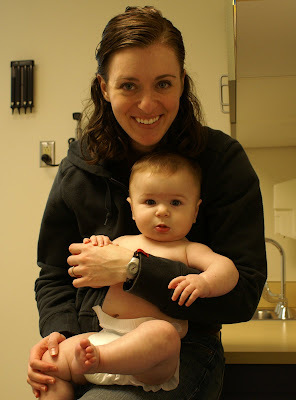 In the meantime… Here are some pictures from our official 6 mos. check-up (a euphemism for needles, Tylenol and banshee crying). 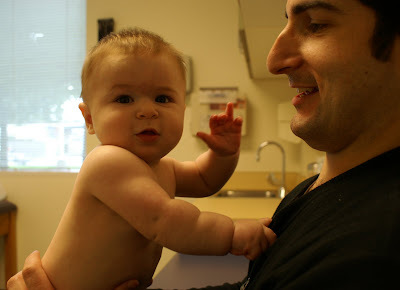 Check-ups are a family affair. Mom comforts the banshee baby. And Dad comforts the Mom. Awww! I love how Bubbers is growing up! Six months is one of my favorite baby ages. They are just so adorable with their beautiful skin and delicious fat rolls plus they are really coming into their personality. Enjoy him!! (Love the new blog, Heidi). How lucky for you that your husband is able to go to those apointments with you both! Vaccinations are the worst! I really think its harder on me than on the baby. Cori would call and ask how everything went, and it was all I could do to not fall apart about the whole affair even an hour or two later. At the hospital where Grant was born, they did all his testing and his vitamin K shot in the hospital room with us there. Cori held Grant for his first shot, and for the foot pricky thingy they do (The nurse had to punch Grants foot with that needle 3 times… I very nearly left the room). Cori has a totally new understanding. Its rough. But babies are so resiliant. It doesn’t phase them. That is of course until they put it together that a smily lady in scrubs =’s two or three stingers in the leg. Grace still gets really upset when she sees nurses. That little Bubbers is a cutie! Joshua, on the other hand, started crying when the nurse just smiled at him. But by the time we’d gone out to the car, he’d already cried himself to sleep. He had to get those billirubin tests in his foot six different times or so his first few weeks of life, but those didn’t bother him. 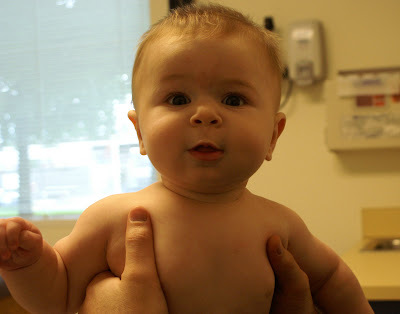 We did find out he’s in the 97th percentile for height. Big boy! (75th for weight.) How big is Bubbers? Tearese–Wow–I’m impressed that Elora didn’t even notice her shots! Has she always been like that or just recently? Poor little Joshua. Bubbers was officially 19 lbs. 2 ounces (holy smokes!). He is getting very heavy for my poor weak arms.